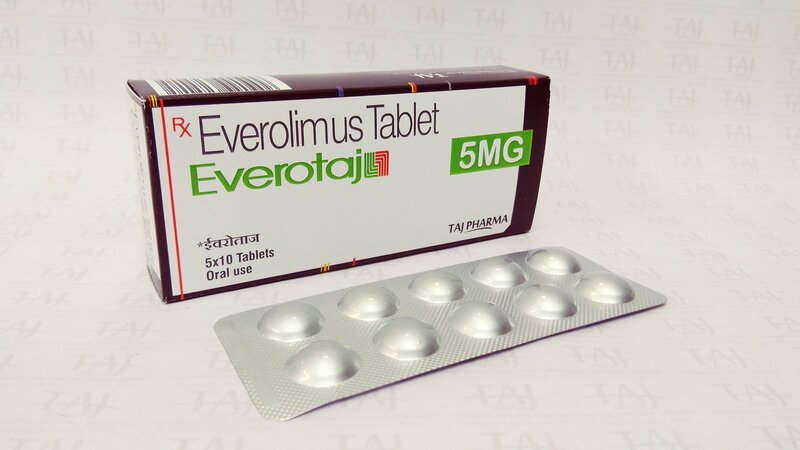 Everolimus is used to treat kidney cancer that has spread and advanced pancreatic neuroendocrine cancer (pNET). It may be used with the drug exemestane to treat breast cancer that has spread. It’s best to read this information with our general information about the type of cancer you have. During treatment, you will see a cancer doctor and a cancer nurse. This is who we mean when we mention doctor or nurse in this information. You’ll see your doctor and nurse regularly while you’re having everolimus. This information may help you discuss any questions about your treatment and its side effects with them. Everolimus works by blocking a protein, called mTOR, which makes some cancer cells grow. This may help to stop or slow down the cancer growing. It can also stop the cancer cells making new blood vessels. This may help shrink the cancer. Everolimus may only be available in some situations. Your cancer doctor can tell you if it’s appropriate for you. Some people may have it as part of a clinical trial. If a drug isn’t available on the NHS, there may be different ways you are still able to have it. Your cancer doctor can give you advice. We have further information on what to do if a treatment isn’t available. You take everolimus as a tablet once a day. Take it at the same time every day. Swallow the tablet whole with a glass of water – don’t crush or chew it. You can take it with or without food. Avoid grapefruit juice and grapefruit during treatment with everolimus as it can affect how the drug works. Always take everolimus exactly as your nurse or pharmacist explained. This is important to make sure it works as well as possible for you. If you forget to take a tablet, don’t take a double dose. Keep to your regular schedule and let your doctor or nurse know. Keep tablets in the original package away from heat and direct sunlight. Get a new prescription before you run out of tablets and make sure you have enough for holidays. Everolimus is a long-term treatment and you should carry on taking it for as long as your doctor tells you. You’ll have regular blood tests to check how well it’s working for you. We have included the most common side effects of everolimus here. We haven’t included all the less common and rarer side effects. You may get some of the side effects we mention, but you will not get them all. The side effects of everolimus are generally mild and may get better during treatment as your body adjusts to the medicine. Sometimes, if a side effect is more severe, your doctors may need to reduce the dose or stop the treatment for a short time. Some people may need to stop taking the treatment completely. Your doctor can prescribe drugs to help control some side effects. It is important to take them exactly as your nurse or pharmacist has explained. Your nurse will give you advice about managing side effects. After your treatment is over, side effects will start to improve. Always tell your doctor or nurse about the side effects you have. Most side effects gradually improve when treatment stops. If you have another anti-cancer treatment with everolimus, some side effects may be worse. You may also have side effects not listed here. Sometimes cancer drugs can result in very severe reactions, which rarely may be life threatening. Your cancer doctor and nurse can explain the risk of these side effects to you. During treatment, your mouth may become sore or dry, or you may get mouth ulcers. Drinking plenty of fluids and cleaning your teeth regularly and gently with a soft toothbrush can help prevent infection. Don’t use mouthwashes bought over the counter without checking with your nurse or doctor first. Some contain ingredients such as alcohol that can make mouth problems worse. Tell your nurse or doctor if you have mouth problems. They can prescribe mouthwashes and medicine to relieve soreness and treat or prevent mouth infections. You may develop a rash and your skin may become dry or flaky. Some people also feel itchy. These side effects are usually mild but occasionally can be more severe. Speak to your doctor or nurse if you have any skin changes. They can advise you about creams or lotions and prescribe medicines to relieve itching. Feeling tired is a common side effect of everolimus. It’s important to try to pace yourself and get as much rest as you need. Try to balance this with some gentle exercise, such as short walks. You may have diarrhoea or tummy pain. This can usually be controlled with medicine. However, if it’s severe or continues for more than 24 hours, contact the hospital on the number you’ve been given. It’s important to drink two litres (three and a half pints) of water or other clear fluids a day if you have diarrhoea. Everolimus can temporarily weaken your immune system, which is your body’s defence against infections. During treatment you are more likely to get infections. It’s important to report any signs of infection to your doctor as soon as possible. you have any symptoms of an infection such as a cold, sore throat, cough, passing urine frequently (urine infection) or diarrhoea. Feeling sick is a common side effect. Your doctor can prescribe anti-sickness (anti-emetic) drugs to prevent or help with this. If the sickness isn’t controlled, tell your cancer doctor or nurse. They can prescribe other anti-sickness drugs that should work better for you. You may notice that food tastes different. You could try using seasoning, spices and herbs to flavour your food. Some people find cold food tastes better than hot food. Most people find that their taste returns to normal after treatment finishes. Your nurse or a dietitian at the hospital can give you advice about what can help. Some people lose their appetite while they’re taking everolimus. If you have a poor appetite, try to eat small amounts as often as possible. Keep snacks, such as nuts or dried fruit, handy to eat whenever you can. If you are finding it difficult to eat or you are losing weight ask to see the dietitian at your hospital. They can give you advice on how to boost your appetite and maintain your weight. Our section on the building-up diet has useful tips. Some people have indigestion or acid reflux (acid comes up from the stomach into the gullet) when taking everolimus. Tell your doctor if you are affected. They can prescribe treatment to help. Everolimus can reduce the number of blood cells in your blood. You will have regular blood tests done to check the numbers of blood cells. Red cells in your blood carry oxygen around the body. If your red blood cell numbers are low this is called anaemia. It may make you feel tired or short of breath. Tell your doctor or nurse if you have these symptoms. You may need to have a blood transfusion if your red blood cell count becomes too low. Platelets help the blood to clot. If your platelet numbers are low you may bleed or bruise more easily. This can cause nosebleeds or other bleeding. Bleeding is usually mild but sometimes can be serious. If you cough up blood, see blood in your urine, have black stools (poo), or have any other unusual bleeding contact your doctor straight away. pain in your chest when you breathe in. If you have any of these symptoms, contact your hospital straight away using the 24-hour contact number you’ve been given. Pneumonitis can be mild and may not always need treatment. But if it is more severe your doctor may treat it with drugs that reduce inflammation (steroids). Some people have an increase in their blood sugar when taking everolimus. You will have regular blood tests to check this. If your blood sugar is too high, you may feel thirsty, need to pass urine more often and feel hungry. Tell your doctor or nurse if you have any of these symptoms. If you’re diabetic, you may find that your blood sugar levels are higher than usual. Talk to your doctor or nurse so that you know how to manage this. You may need to adjust your insulin or tablet dose. Some people get swelling around their eyes, or in their hands, ankles or feet, because of fluid build-up. This often settles down by itself or your doctor may prescribe drugs to make you pass more urine (diuretics) to help get rid of some of the fluid. Tell your doctor if you put on weight very quickly. This can be a sign of more serious fluid build-up. Everolimus may cause the levels of cholesterol in your blood to increase. Your doctor or nurse will take blood samples regularly to monitor this. Some people find that everolimus causes headaches. Taking painkillers, such as paracetamol, can usually relieve this. Let your doctor or nurse know if the headaches continue. Some people have back pain or joint pain while having treatment. Your doctor can prescribe painkillers to relieve pain. Everolimus can affect sleep in some people. Tell your doctor if you are having difficulty sleeping. Sometimes everolimus can affect how well your kidneys work. Your doctor will check your blood regularly to monitor this. If you pass less urine or stop passing urine contact your doctor straight away. Everolimus may cause changes in the way your liver works. This should return to normal when the treatment finishes. You’re very unlikely to notice any problems but your doctor will take regular blood samples to check that your liver is working properly. Let your doctor know if you develop pain in your right side. If you become breathless, develop a cough or notice swelling in your arms or legs (caused by a build-up of fluid) contact a doctor immediately. Wounds may take longer to heal while you’re having treatment with everolimus. If you have any surgery planned, you may need to stop taking everolimus before the operation and not start taking it again for a few weeks afterwards. Your doctor will give you more advice. Everolimus can sometimes affect the levels of these in your blood. You will have regular blood tests and your doctor may prescribe you supplements to take if the levels are too low. Women taking everolimus may notice their menstrual cycle becomes irregular. Rarely, periods may stop altogether during treatment. Everolimus can cause redness on the palms of the hands and soles of the feet. Sometimes the hands and feet become sore or swollen. There may also be changes in sensation, such as numbness or tingling. Tell your doctor if you are affected. They may give you lotions, moisturisers or painkillers. wearing gloves when doing housework or gardening. Everolimus may cause high blood pressure. If you have frequent or severe headaches or any dizziness, tell your doctor. You may need to have your blood pressure checked. If you are already on treatment for your blood pressure, you may need to have your blood pressure checked more often. Talk to your doctor if you have any concerns. Everolimus may cause a blood clot. This may cause symptoms such as pain, redness and swelling in a leg, or breathlessness and chest pain. Blood clots can be very serious, so it’s important to tell your doctor straight away if you notice any of these symptoms. Most clots can be treated with drugs that thin the blood. The doctor or nurse can give you more information. Some medicines, including those that you can buy from a shop or pharmacy such as St John’s Wort, can be harmful to take when you’re taking everolimus. Tell your doctor about any medicines you take, including over-the-counter drugs, complementary therapies, supplements and herbal drugs. If you need to buy medicines over the counter, tell your pharmacist you are taking everolimus. You should speak to your doctor before getting any live vaccines during and after your treatment. Your immune system may be weak, so vaccines may be less effective and could be harmful. intranasal influenza (given into the nose). Your ability to become pregnant or father a child may be affected by having this treatment. It’s important to discuss fertility with your doctor before starting treatment. It’s not advisable to become pregnant while having everolimus, as it may harm the developing baby. It’s important for women who could become pregnant to use effective contraception during treatment. You can discuss this with your doctor. There is a potential risk that everolimus may be in breast milk. Women are advised not to breastfeed during treatment. If you feel dizzy or drowsy, or if tiredness affects your concentration, don’t drive or operate machinery. If you need to go into hospital for any reason other than cancer, always tell the doctors and nurses that you are taking everolimus. Tell them the name of your cancer doctor so they can ask for advice.